The United Nations (UN) agencies and the Committee of Statistics of the Republic of Kazakhstan organized the first large-scale event in the field of statistics related to Sustainable Development Goals (SDGs) in Borevoye on 25-27 September. The expert meeting started the implementation of global indicators and identified priority national indicators for SDG monitoring in Kazakhstan. The three-day seminar on SDG statistics reviewed global and national statistical developments and offered an opportunity for the Committee for Statistics and key ministries to learn from other country experiences on the “nationalization” of global indicators. Participants reviewed global indicators and developed indicators for Kazakhstan in the working groups. Lina Benete, education programme specialist from UNESCO Almaty, supported the working group on education. The group determined the availability of data for 43 SDG4 indicators, identified synergies with the national education priorities and identified national indicators to supplement the global list. 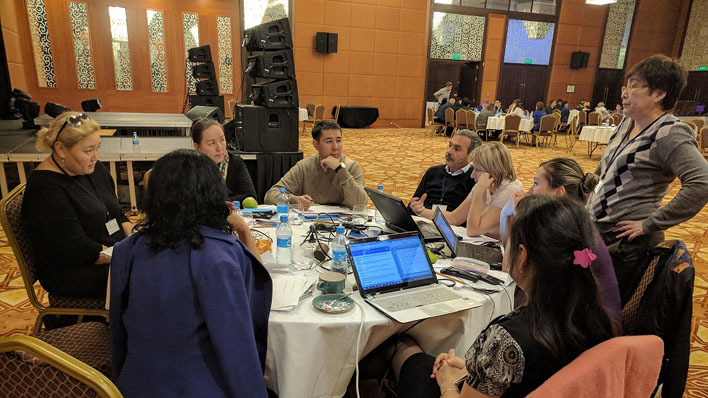 The discussions at the meeting identified the needs of potential trainings on statistics in Kazakhstan and strengthened a network of partners to continue cooperation on SDG4 monitoring. Over the past years, the UNESCO Institute of Statistics has been working closely with the Ministry of Education and Science on the development of education indicators. In order to gather data for monitoring Sustainable Development Goal 4 on “Quality education”, it is essential to advance the official statistics collection. This will play a key role in providing data for follow-up and review of the implementation of SDG4 in Kazakhstan. in September 2015, the heads of UN member states, including Kazakhstan, adopted 17 Sustainable Development Goals to be achieved by 2030. To assess progress in the SDG achievement of each country, a list of 230 indicators was developed. This progress will be monitored at global, regional and national levels.